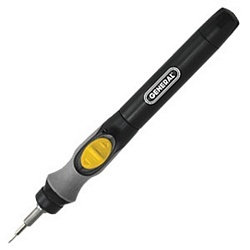 Make delicate repairs of computers and electronics go so much faster with a lightweight and compact motorized screwdriver. With a 100 rpm super-torque drive motor that provides at least 10 hours of operation on one set of batteries, this ergonomically designed driver serves as six tools in one with interchangeable 1/8" precision bits. Requires 2 AAA batteries, included. Pros: Worked okay for about a year, then the gears suddenly stopped working. I took it apart and found a drive gear completely devoid of teeth. It probably stripped because I used it to turn screws manually, instead of using the motor. That probably exerted more force on the plastic gear than it was designed for. It's okay if you don't do that. Cons: A little slow. Not good for screws that are tight. Other Thoughts: It's a nice idea that I was looking out for a long time. I just wish they had used brass instead of plastic gears. I'd pay 10 bucks more for better gears. Pros: Works well until it doesn't work at all. Easy fingertip control. Cons: I have bought two of these and both of them quit working within a month. Just stopped. Great idea, it works fine until it doesn't work at all! Wish I could get one that worked! Some have found that rechargeable batteries provide better operation. In any case, please contact us for an exchange or refund. We're sorry you found the product disappointing.